Last fall I was talking Krags with a collector of US Martial arms at a local gunshow. During the course of conversation he asked me if I had ever seen a Krag .22 Gallery Practice Rifle. I hadn’t, but soon we were at his table examining it. By the end of the day we had agreed on the price of $1500. I was rather nervous during the transaction, as this was easily the most I had ever spent on a rifle. However the excitement for me was just begining. Once I took the piece home, I was on the phone with some fellow Krag collectors and soon found out that my newest toy was not only a rather scarce item (841 were produced), but that it lettered in Frank Mallory’s serial number list. Additionally the rifle, serial number 477360, is listed in Frank’s book, The Krag Rifle Story, as one of the 100 most significant Krags. Turns out Freeman Bull of Springfield Armory used this piece for some accuracy testing in 1907. I quickly contacted Frank and my check was off to him the next day for one of his letters on the rifle. The next day I took the rifle into work for show and tell. I work in the firearms section of the Maine State Police Crime Lab and wanted to share my good fortune with the two examiners in my section. At lunchtime I was looking over the two boxes containing the civilian sights (A lyman 17A and Redfield 100-K) that came with the purchase. Written on the outside of one of the boxes was a man’s name and address that I hadn’t noticed before. Since the address was in the town I work in, I dug out the phone book, hoping to catch a relative’s name that might know who had owned the rifle. My interest was heightened when the only name and address listed in the phone book was exactly the same as on the box. 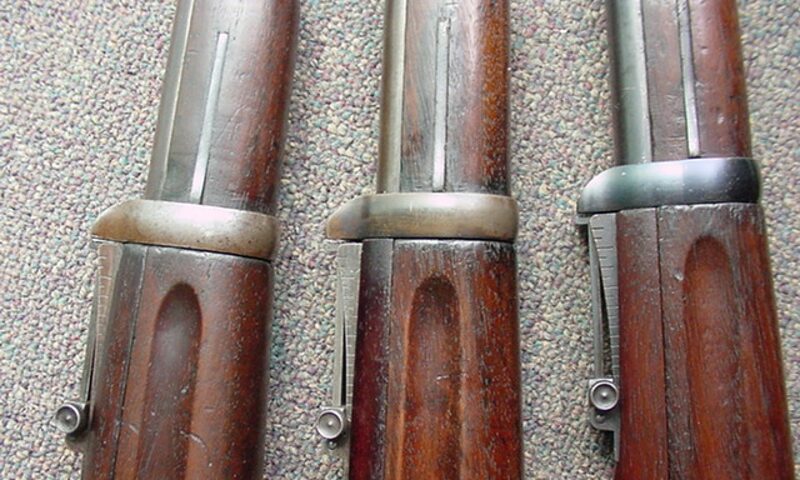 I called and soon was talking with the rifles owner…..from 1935! Turns out the man is still alive at 91, sharp as a tack and honored my request to meet face to face to discuss the rifle. We met a few days later and spent the better part of an hour discussing the rifle. He had purchased it from a sporting goods store in 1935 for the enormous sum of $15. It was put on layaway for 5 weeks, paid off $3 a week. He had later ordered the sights to compete in local matches. Around 1960 he sold the rifle to a local antique dealer for $100. While he held the rifle he told me how he had sanded it and oiled it and jokingly asked me if it was for sale. The sanding may explain the lack of a cartouche. I typed up a letter of what he told me about the history of the rifle and he signed it for me. We shook hands and parted company. About two weeks later I received an envelope in the mail containing a letter from him along with the original sales receipt from 1935! Frank Mallory’s letter along with photocopies of the targets used and various other correspondence pertaining to sn# 477360 arrived soon after. The rifle remains the center of my small but growing collection. I’ve had several offers from other collectors who wished to buy it, but I believe that luck was with me that day, and I shall keep it.